Ke Nako! Celebrate Africa's Humanity: This slogan was launched in November 2007 for the 2010 World Cup Soccer and declared boldly in an indigenous language "It is Time" - time for Africa. And it was followed soon by optimistic voices and prophets of doom alike about hosting a world class international sporting event in an African country. And then there was the 'Waka Waka' to celebrate the optimism - the official song for the event performed by Shakira: "Today's your day. Feel it.... This time for Africa..". With my love for social media and its potential, and my passion for African development - I will be the first to admit that it was indeed a very special time in Africa. Was it a time for Africa? Away from the world class soccer stadia, the fan parks, elaborate shows, the media conferences, the lobby meetings for business people and the vuvuzela-crazy crowds - in the rural parts, in the muddy townships? Was it also Ke Nako? Did the time come? “I think as South Africans, we need to remember that we are a teenager in the world of nations and for us this has been a proud moment since 1994 and from the economic point of view all the investment was money well spent,” the South African Minister of Finance, Pravin Gordhan said at a FIFA press conference early this month. I am no economist. It is being said over and over again in the media and in workshops that Africans may not see the benefits of the World Cup immediately and that the investment made now will pay off in the long run for the country, and set South Africa up as economic force on the continent. This is good news and opens a window of hope in terms of the potential white elephants that we erected as monuments for the world's entertainment on the doorstep of poverty. Take the extravagant Mbombela Stadium in Nelspruit, close to Kruger National Park as an example - with its roof suspended from 18 bright iron "giraffes" and its zebra-striped seating. The local people saw their schools closed two years ago so that the construction company could use these as offices. (Unbearable). There were quite a few such decisions in favour of the one-month event and short term solutions that are difficult to understand. The exclusion of many South Africans from the immediate benefits of the World Cup is even harder to swallow. Mat Mackay, journalist of WWOS, labels the same magnificent Nelspurit stadium the 'stadium of shame' and for good reason as this video clip shows. Xenophobia in South African townships is as real as the fact that Paul the Octopus predicted a win for Spain against the Netherlands in the final and was right. The South African government has tried their utmost to play down the problems of foreigner hatred as 'ordinary crime' and 'just rumours' in the media. Police Minister, Nathi Mthethwa angrily denied claims from organisations on the ground, saying "an investigation had shown that those leaving were foreign migrant workers returning home". He accused politicians who had raised the spectre of violence of being "peddlers of fear". Yet, there was a heavy police presence in townships on Monday, the day after the World Cup. My own housekeeper from Zimbabwe simply replied on enquiry, about her well-being: "Tomorrow. They said they will kills us, tomorrow. Three-quarters of the people have fled (if true, close to 5000 people in one community!) , but I am staying". The real face of xenophobia showed itself in 2008, and no matter how much denial - or whatever name you call it - it remains an underlying theme in our poor South African communities, as shown by this excellent piece in The Daily Maverick: Faces of Xenophobia. So difficult to face the unbearable light of truth in the shadow of the euphoria: South Africa welcomed the western and eastern visitors with their money, but chased away their own African neighbours with empty pockets - seeking only a way to make a living themselves. There was such excitement in South Africa, and indeed in Africa, about the Soccer World Cup. It is after all true that soccer (or football, called by some) is not so much a sport in Africa as it is culture - a tradition; a way of life. The Belgium-born photographer Jessica Hilltout 'gets' this about the beautiful game: ""In Africa football is not a religion, but it is everything a religion should be", she says about her inspiring book called 'AMEN' in which she pays homage to those people that will never benefit from the World Cup, no matter how much public relations spin sanctioned by the Swiss FIFA boardroom. 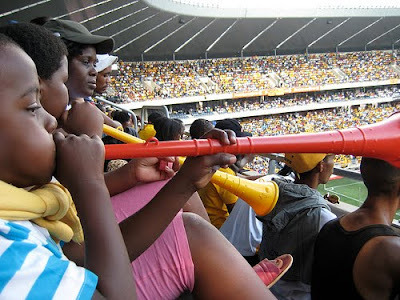 On a continent where people will walk miles to support their local teams on dusty fields and meet with neighbouring villagers, there is little need for a vuvuzela button in YouTube or a dedicated Twitter portal for the World Cup. A ball, shoes and some players on an uneven field. And the benefits are clear, with free trade amongst the fans and no corporate owners of the game except all those who are part of it and make it happen. When all is said and done, it is unbearable for me to see that so little immediate benefit has been achieved for those living with poverty every day. I cannot help but remember the elderly Sarah losing her handmade table cloths at the hands of two police men when she sat just 3 meters too close to the entrance of one of the stadiums. So, as much as I really want to celebrate with our President Jacob Zuma, and as much as I also enjoyed the moment - I do not feel it. Not really. It is not here yet. Not from where we stand.